The Mitsubishi Group (三菱グループ; Mitsubishi Gurūpu), Mitsubishi Group of Companies, or Mitsubishi Companies is a Japanese conglomerate consisting of a range of autonomous businesses which share the Mitsubishi brand, trademark and legacy. The Mitsubishi group of companies forms a loose entity, the Mitsubishi Keiretsu, which is often referenced in US and Japanese media and official reports. These companies all descend from the zaibatsu of the same name, founded in 1870 after the Meiji Restoration, by Iwasaki Yataro. Originally a shipping and trading company, under Iwasaki it developed close ties with the Japanese government and ventured into mining, ship repair, newspapers, marine insurance, and finance, laying the foundation for Mitsubishi's future diversification into industry and technology. Mitsubishi was the second largest of the family-owned industrial-financial conglomerates that dominated the economic life of Japan in the late nineteenth and early twentieth centuries, and played a central role in the modernization of Japanese industry. Forced to disband by Allied occupation forces after World War II, Mitsubishi Corporation reconstituted itself in 1954, and participated in the unprecedented economic growth of Japan during the 1950s and 1960s. In 2007, Mitsubishi Motors ranked as the sixth largest automaker in Japan and the seventeenth largest in the world by global unit sales. As of 2007, Mitsubishi Corporation, a member of the Mitsubishi Group, was Japan's largest general trading company (sogo shosha), with over 200 bases of operations in approximately 80 countries worldwide. Together with its over 500 group companies, Mitsubishi employs a multinational workforce of approximately 54,000 people. 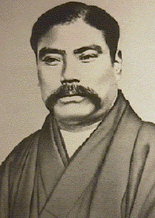 Born in a provincial farming family in Aki, Tosa province (now Kochi prefecture), Yataro Iwasaki (1835-1885) studied under the reformist Toyo Yoshida, who influenced him with ideas about opening and developing Japan through industry and foreign trade. Through Yoshida, he found work as a clerk for the Tosa government, and was eventually promoted to financial manager of the Tosa clan's trading office in Nagasaki, responsible for trading camphor oil and paper to buy ships, weapons, and ammunition. Following the Meiji Restoration in 1868, which forced the disbandment of the shogunate's business interests, Iwasaki travelled to Osaka and leased the trading rights for the Tosa clan's Tsukumo Trading Company. In 1870, the company adopted the name Mitsubishi Commercial Company (Mitsubishi Shokai, 三菱商会) when Iwasaki became president, and in 1873, the company officially changed its name to Mitsubishi. Mitsubishi diversified rapidly, acquiring more ships and expanding its passenger and freight services. Iwasaki supported the new Japanese government, and Mitsubishi provided the ships that carried Japanese troops to Taiwan and later to put down a rebellion in Kyūshū. He founded the Mitsubishi Transportation Company, and received more ships and a large annual subsidy from the government in return for carrying mail and other supplies. With government support, he was able to acquire further shipping rights on the lucrative Shanghai route and drive out two large foreign shipping companies. Iwasaki taught his subordinates to "worship the passengers" because they were sources of revenue. He frequently entertained dignitaries and cultivated friends and business connections who later did him many favors. Iwasaki began to diversify, investing in mining, ship repair, newspapers, marine insurance, and finance, and establishing the businesses that formed the foundation for the Mitsubishi organization. The company bought into coal mining in 1881, by acquiring the Takashima mineto to produce fuel for their extensive steamship fleet. Mitsubishi Kawase-ten, a financial exchange house that also engaged in warehousing, was the forerunner of today's Mitsubishi Bank and Mitsubishi Warehouse & Transportation. In 1884 Iwasaki leased the Nagasaki Shipyard and renamed it Nagasaki Shipyard & Machinery Works, allowing the company to venture into full-scale shipbuilding. Iwasaki purchased copper mines, and participated in establishing the insurance company that is now Tokyo Marine and Fire. He also led the school that became the Tokyo University of Mercantile Marine. In 1885, Iwasaki lost control of his shipping company in the wake of a political struggle that had buffeted Japan's marine transport industry. The company merged with a rival and became Nippon Yusen (NYK Line), which later returned to the ranks of the Mitsubishi companies. The same year, Iwasaki died of stomach cancer at the age of 50. Yanosuke Iwasaki (1851-1908) succeeded his brother as head of the Mitsubishi organization in 1885. Under his autocratic leadership, Mitsubishi continued to grow. He incorporated Mitsubishi as a modern corporation, rebuilt the organization around its mining and shipbuilding businesses, and expanded its interests in banking, insurance and warehousing. In 1890, he purchased 80 acres of the land next to the Imperial Palace in Tokyo, now known as Marunouchi. In 1893, Iwasaki Hisaya (1865 – 1955), son of Iwasaki Yataro, assumed the presidency of Mitsubishi. He had graduated from the University of Pennsylvania, and he restructured Mitsubishi to support increasingly diverse business operations, setting up divisions for banking, real estate, marketing, and administration, as well as for the original mining and shipbuilding businesses. Iwasaki Hisaya believed in the observance of firm ethical principles in business dealings, and, after the outbreak of World War I in 1914, called on all Mitsubishi employees to uphold their commitment to integrity and fairness. He donated, to the city of Tokyo, two expansive Japanese gardens, Rikugien and Kiyosumi-Teien, and established an oriental library, Toyo Bunko. Koyata Iwasaki (1879 – 1945), the son of Iwasaki Yanosuke, took over the presidency of Mitsubishi in 1916. He had also studied abroad, and had graduated from Cambridge University. For almost 30 years, he played an important role in shaping Japanese industry. Under his leadership, the various divisions of Mitsubishi were incorporated into semi-autonomous companies. The organization ventured into industries such as paper, steel, glass, electrical equipment, aircraft, oil, and real estate. Automobiles, aircraft, tanks, and buses were developed by the companies that later became Mitsubishi Heavy Industries. Mitsubishi Electric grew into an industry leader in electrical machinery and home appliances. The Iwasaki family made a public offering of shares of the core Mitsubishi holding company, and by the end of World War II, outside investors held nearly half of its equity. As Mitsubishi built a broadly-based conglomerate, it played a central role in the modernization of Japanese industry. Mitsubishi Heavy Industries, which includes these industrial companies. Mitsubishi Motors, the sixth largest Japanese auto manufacturer. The Mitsubishi Zero, built by Mitsubishi, was a primary Japanese naval fighter in World War II. It was used by Imperial Japanese Navy pilots in the attack on Pearl Harbor and in kamikaze attacks until the end of the war. Allied pilots were astounded by its maneuverability, and it was very successful in combat until the Allies devised tactics to utilize their advantage in firepower and diving speed. Mitsubishi also built the "Raiden," a land-based interceptor. As well as building prominent fighters, Mitsubishi also built many of Japan's most famous bombers of the war, such as the G3M, the G4M, the Ki-21, and the Ki-67. During the 1930s, Mitsubishi had also built the single-engined Ki-35. After World War II, the Allied occupation forces demanded that Japan's big industrial groups disband. Koyata Iwasaki resisted conforming to these demands, but passed away in 1945. Mitsubishi Headquarters disbanded on September 30, 1946. The Mitsubishi holding company was dissolved, and the trading house fragmented into hundreds of independent enterprises. Most of these companies abandoned the Mitsubishi name and emblem under pressure from the occupation forces. In 1952, when the San Francisco Peace Treaty was concluded, Japan regained a place in the international community. In 1954, more than 100 companies that had been part of the Mitsubishi trading house, merged to re-establish Mitsubishi Corporation. The principal components of Mitsubishi Heavy Industries reunited in 1964. Companies that had abandoned the Mitsubishi name after the war began using it, and the three-diamond logo, again. Mitsubishi was part of Japan’s unprecedented economic growth during the 1950s and 1960s. As Japan modernized its energy and materials industries, the Mitsubishi organization created Mitsubishi Petrochemical, Mitsubishi Atomic Power Industries, Mitsubishi Liquefied Petroleum Gas, and Mitsubishi Petroleum Development. Mitsubishi’s traditional emphasis on technological development directed it into new fields such as space exploration, aviation, oceanography, data communications, computers, and semiconductors. Mitsubishi companies also became large-scale providers of consumer goods and services. In 1969, the Mitsubishi Foundation was established to commemorate the centennial anniversary of the founding of the first Mitsubishi company. Individual Mitsubishi companies also support worthy causes through their own charitable foundations. Mitsubishi pavilions have been highlights of expositions in Japan since the historic EXPO'70 in Osaka in 1970. Mitsubishi companies take part actively in the lives of the communities they serve. As of 2007, Mitsubishi Corporation, a member of the Mitsubishi Group, was Japan's largest general trading company (sogo shosha), with over 200 bases of operations in approximately 80 countries worldwide. Together with its over 500 group companies, Mitsubishi employs a multinational workforce of approximately 54,000 people. Mitsubishi has long been engaged in business with customers around the world in many industries, including energy, metals, machinery, chemicals, food and general merchandise. The name Mitsubishi (三菱) has two parts: "mitsu" meaning "three" and "bishi" meaning "water caltrop" (also called "water chestnut"), and hence "rhombus," or “diamond,” which is reflected in the company's logo. It is also translated as "three diamonds". The Mitsubishi emblem was a combination of the Iwasaki family crest (three stacked rhombuses) and the oak-leaf crest of the Yamanouchi family, leaders of the Tosa clan which controlled the part of Shikoku where Iwasaki Yataro was born. Maintaining the value of the logo as a symbol of quality and reliability in products and services is a top priority at every Mitsubishi company. The Mitsubishi companies have established the Mitsubishi Corporate Name and Trademark Committee and an affiliated liaison group to establish and enforce guidelines for proper use of the Mitsubishi logo. The Mitsubishi.com Committee is meant to maintain the overall integrity of the brand through a portal web site. Mitsubishi companies have secured nearly 5,500 registrations for the three-diamond logo in more than 140 nations. The Mitsubishi group of companies forms a loose entity, the Mitsubishi Keiretsu, which is often referenced in US and Japanese media and official reports; in general these companies all descend from the zaibatsu of the same name. A keiretsu is a common feature of Japanese corporate governance, and refers to a collaborative group of integrated companies with extensive share crossholdings, personnel swaps and strategic co-operation. The top 25 companies are also members of the Mitsubishi Kin'yōkai, or "Friday Club," and meet monthly. Mitsubishi Motors Corporation (三菱自動車工業株式会社, Mitsubishi Jidōsha Kōgyō Kabushiki Kaisha) is the sixth largest automaker in Japan and the seventeenth largest in the world by global unit sales. It was formed in 1970 from the automotive division of Mitsubishi Heavy Industries. Throughout its history, it has courted alliances with foreign partners, a strategy pioneered by their first president Tomio Kubo to encourage expansion, and continued by his successors. A significant stake was sold to Chrysler Corporation in 1971, which it held for 22 years, while DaimlerChrysler was a controlling shareholder between 2000 and 2005. Chrysler LLC (former DaimlerChrysler) continues a joint-venture platform with Mitsubishi Motors with its Dodge Caliber, and Jeep Patriot and Compass. Long term joint manufacturing and technology licensing deals with the Hyundai Motor Company in South Korea and Proton in Malaysia were also forged, while in Europe, the company co-owned the largest automobile manufacturing plant in the Netherlands with Volvo for ten years in the 1990s, before taking sole ownership in 2001. Recently, Mitsubishi Motors has made an alliance with PSA Peugeot Citroen. Mitsubishi benefited strongly from these alliances in the 1970s and 1980s, increasing its annual production from 250,000 to over 1.5 million units. Its strong presence in south-east Asia meant it suffered more than most of its competitors in the aftermath of the 1997 East Asian financial crisis, and since then the company has struggled to consistently increase sales and maintain profitability. Mitsubishi Motors reached total production of 1.3 million cars in 2007. These companies are members of the Mitsubishi Kinyokai (or Friday Club), and meet monthly. Dai Nippon Toryo Co., Ltd.
MT Insurance Service Co., Ltd.
↑ Tachikawa Ki-35 Retrieved May 16, 2008. ↑ The Mitsubishi Mark Retrieved May 16, 2008. ↑ Organisation Internationale des Constructeurs d'Automobiles, World Motor Vehicle Production by manufacturer (2006), OICA.net Retrieved May 16, 2008. ↑ History of Mitsubishi, Funding Universe. Retrieved May 16, 2008. ↑ 5.0 5.1 Mitsubishi Motors Corporation Vehicle Manufacturer Strategic Insight, Automotive World Retrieved May 16, 2008. Mitsubishi Public Affairs Committee. "The Four Presidents Who Built the Foundations of Mitsubishi". Retrieved December 28, 2015. Tanaka, Kenzō. Challengers, pioneers, and innovators: the front lines of the Mitsubishi Corporation Group. Tokyo: Mitsubishi Corporation, 2004. Yamamura, Kozo. "The Founding of Mitsubishi: A Case Study in Japanese Business History" The Business History Review 41(2) Summer, 1967. Retrieved November 10, 2014. "The Mitsubishi Mark", Mitsubishi.com. Retrieved May 18, 2008. This page was last modified on 10 October 2018, at 15:18.